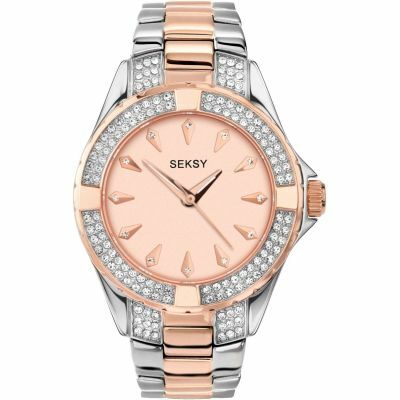 The Secksy rose gold color watch is a beautiful looking watch, my wife is very pleased with it. I bought it for her for Christmas.It was delivered here to the Isle of Man the next day, very quick service. This is a fantastic watch. Bought it as gift to my wife and she was in love with it. My wife had literally looked at dozens of rose gold watches online and in store. From her research I was left with six to choose from as part of her Christmas present. Thankfully I chose the Seksy one which she is delighted with!! The watch looks and feels more expensive than some others she has tried which were nearly double the price. The service was superb and we are already recommending your site to friends and family. Thank you. Watch looks impressive. Problem is its more the size of a mans watch so for a lady with delicate hands its simply far to big ! Good looking watch looks brilliant on my daughters wrist and has been admired by those who have seen it. Looks good, feels good! Lets hope the lady agrees. Im sue she will. Its the second SEKSY watch I have bought for her so the signs bode well. I got some unexpected overtime and the wife did what wives do. I had already got her Xmas presents wrapped and under the tree when she announced she had seen a watch advertised on the TV. I went on line and she picked out a watch in rose gold with jewels round the bezel it is very similar in style to divers watch but much more dressy she loves it and has not taken it off Christmas this year , Sorted !!! Xmas gift for my wife. Excellent price and fast delivery. Bought this as a gift for my fiancée. Ordering the gift wrapping with a printed message on the card. Unfortunately, the encoding of the é got mangled along the way, which was disappointing. Gift for my wife, shes chuffed. The watch looks great, I think better than some more expensive brands. Eye catching colour. It looks and feels solid, with just enough bling to still look smart. I ordered the watch on Sunday, and the watch was delivered to Goldsmiths on the Monday. There they altered the watch for free. Result! Fantastic service will certainly use again. Beautiful watch. 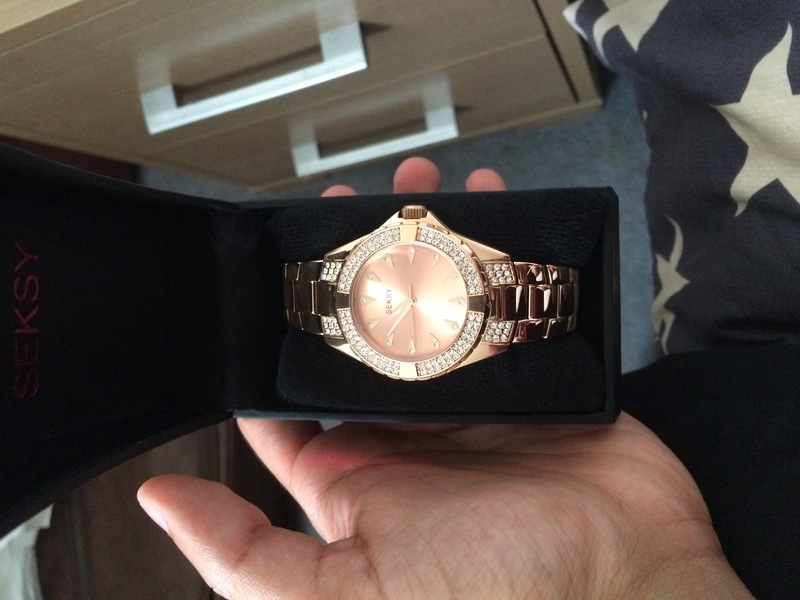 The colour is gorgeous, I have wanted a rose gold watch for quite a while and this would have been my exact choice. 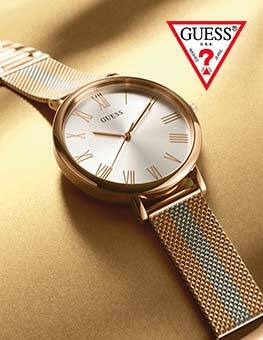 The face is extremely feminine while the size is striking and bold, a definite statement watch! My only criticism is that my sister has the same watch but it was £20 cheaper!! Ladies SEKSY watch, this is a beautiful watch, simple to use with just the one function of telling the time. It has only the one crown for adjusting the time no other buttons to stick in your wrist, the crown pulls out nice and easily and twists smoothly and pushes back into place without having to force it. This watch seems to keep time perfectly but having only had it a week I can only go by how its worked so far. When removing from the box the first thing you notice is the build quality, it looks amazing and has a nice weight to it. The braclet links all move freely so they wrap around the wrist comfortably and is secured with a quality clasp that lies flush to the braclet so no sharp edges to catch on objects or clothing. The gold finish to the watch is floor less, deep in colour and the crystal insets looks nice and expensive which was ideal as this was a gift for my wife. I would say this is an everyday watch it looks good with any outfit so can be worn to work without looking to flash but would also look just as good on a night out. If you want an expensive looking watch that wont break the bank then this is the watch for you. The product was just what I was expecting. It was for my granddaughters birthday. She loved it. Very p,eased with th service and the watch. It is a present to my daughter and. Hope she will. Be pleased with it. Beautiful watch, exactly as described on the website. Feels good, looks good and if it performs like previous buys.......wonderful! not Christmas yet.....her indoors will soon tell how me good it is! This is what I wanted at the great price. The colour was great & the sparkles were not to much, feels solid, not flimsy & the strap was easily adjusted, very happy. 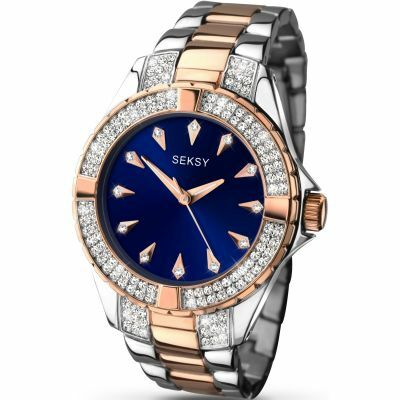 Thank you so much for the beautiful Seksy watch I purchased from you, I have bought it for my Daughter for Christmas who is everything to me I dont know what I would do without her and she deserves to have something so lovely. It is so well made and the diamonds glitter in the light and the colour of rose gold is so unusual. I Know my daughter will absolutely be over the moon with it thanks so much. Also free next day delivery. name on box for a start made it look good ,but when I took the watch out of the box it look great,the style was fab the colour looked great as well best watch I have seen in along time. I should start with a thankd. i was able to surprise my wife. The watch looks too cool on her wrist.It, was very nice service by watch shop. I received my item on time specified. the customer care people were very helpful and helping in making me do right collection. Watch Shop är auktoriserad återförsäljare av Seksy.